140mm (5 1/2") overall depth at base to from of sill. There is no glass included, the deep rebates make it suitable for double glazed units to be fitted. It's 94mm (3 3/4") thick at the top where there's the small overhang with drip edge. Max Opening Is Dependent On How Far The Restrictor Is From The Window Hinges. KW1-KW17, PA20-PA38, PA41-PA49, PA60-PA78, PH4-PH44, PH49-PH50, PO (Isle Of Wight) TR (Isles Of Scilly) ZE (Channel Isles). 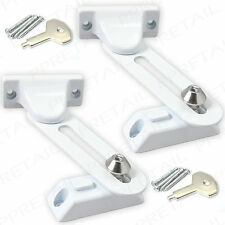 Sash Window Fastener Lock Arm Type. 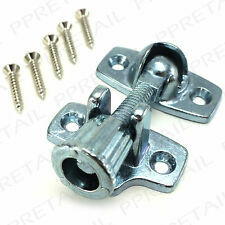 Window Arm Sash Fastener. Arm Levers Over The Receiver To Lock The Window In Place. Main Lock & Receiver Are 45mm x 15 mm. AB31-AB38, AB40-AB56, IV1-IV28, IV30-IV32, IV36-IV40, IV52-IV54, IV63, KW1-KW14, PA21-PA38, PH4-PH41, PH49-PH50, BT (Northern Ireland) HS, IV41-IV49, IV51, IV55-IV56, KA27-KA28, KW15-KW17, PA20, PA41-PA49, PA60-PA78, PH42-PH44,PO, ZE, IM (Isle Or Man) Channel Isles. Velfac 200 Energy Window, triple glazed, timber frame, aluminium faced. External colour is Sepia Brown - RAL8014, internal colour is natural timber clear lacquered. Size 765(w) x 1320(h) x 148(d). Comes with handle with key lock and lockable restrictor. Condition is New. Collection in person only. KW1-KW17, PA20-PA38, PA41-PA49, PA60-PA78, PH4-PH44, PH49-PH50, PO (Isle Of Wight) TR (Isles Of Scilly) ZE (Channel Isles). ERA Gold Window Fastener. Supplied With Colour Coordinated Screws For Perfectly Matching Hardware. Quality Solid Brass Sash Brighton Window Fastener. KW1-KW17, PA20-PA38, PA41-PA49, PA60-PA78, PH4-PH44, PH49-PH50, PO (Isle Of Wight) TR (Isles Of Scilly) ZE (Channel Isles). Suitable For Both Timber And Upvc Windows. Suitable For Both Timber & UPVC Windows. 65mm Sash Lock. Arm Lever Simply Levers Over The Receiver To Lock In Place. 65mm: Length. .970mm [W] x 905mm[H]. QUITE HEAVY DUE TO BEING HARDWOOD..
Sash Window Pole Hook. Fits 20mm Pole. Solid Brass. Suitable For Hard To Reach Places Such As High Windows, Attic Doors & Sky Lights. FITCH FASTENER Polished Chrome Wood Frame Sash Slide/Lift Up Window Twist Lock. Condition is New. Dispatched with Royal Mail 2nd Class Letter. Sash Window Pole Hook. Fits 20mm Pole. Suitable For Hard To Reach Places Such As High Windows, Attic Doors & Sky Lights. JOB LOT Solid Oak Window 24” X 23” Double Glazed In Frames. JOB LOT Solid Oak Windows (individual unit size 24” X 23”) Double Glazed. Condition is Used however all glazing units are fully intact. Varnish has degraded on exterior face but can easily be refinished. metalwork included. You are bidding on all items. will sell individually on request. Set of 5 Glazed Wooden Window Frames: 4 of 44"(w) x 11.5"(h), 1 of 31"x16"
Ideal for horizontal mounting. Horizontal mount, double brass hinges (2 missing), 1 glass cracked. Single Glazing: Rebates: external 16mm, internal 18mm. Brass Plated Sash Fitch Fastener. Sash Window Fitch Fastener. Classic Half Circular Turn Catch Design. Attractive Brass Plated. Main Lock : 62mm x 25mm. AB31-AB38, AB40-AB56, IV1-IV28, IV30-IV32, IV36-IV40, IV52-IV54, IV63, KW1-KW14, PA21-PA38, PH4-PH41, PH49-PH50, BT (Northern Ireland) HS, IV41-IV49, IV51, IV55-IV56, KA27-KA28, KW15-KW17, PA20, PA41-PA49, PA60-PA78, PH42-PH44, ZE, IM (Isle Or Man) Channel Isles. 2018 High quality, New Half Composite Black Window With White UPVC Interior - Over £200 new! The window is new and in brilliant condition with the seal still on both sides and corner protectors on. It has a very secure 6 point locking system - including top and bottom corners. Double Glazed units 675 x 1200 mm and 675 x 379 mm. Comprising 4 mm Hytherm Glass 8 mm Bronze Spacer 4 mm Clear Glass. Mahogany opaque double Glazed window frame. Very heavy. Brass fittings 148 x . Brass furniture included.hinges and catches. The internal glass is intact. Should last years. Very heavy. Leaded double glazed inserts. This is a lovely very heavy mahogany solid wood. Brass fittings. Experience the renaissance of classic window joinery, made of solid pine wood. Windows, whose aesthetic and functional values ​​are unmistakable. They are mainly ordered for country houses and dachas and installed there, also increasingly used in households with a rustic style. 880mm = Mid Point Arch Height. The rebate size is 1735mm high x 815mm wide. All machined to suite either a sash or door. Not included. All traditionally made with mortice and tennon joints and grooves for draught stripping, not supplied. The glass panels within the window is intact.